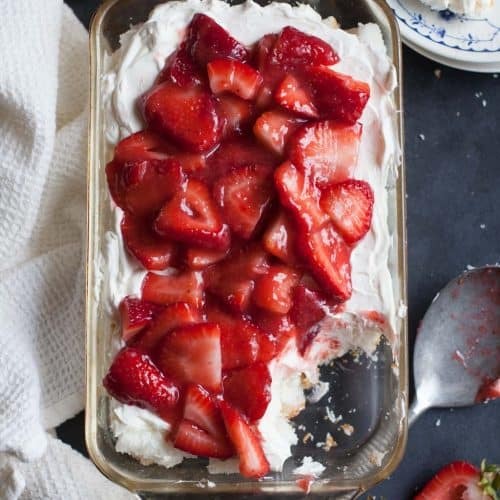 This strawberry angel food lush is free-form layers of cake, cream cheese, whipped cream and tangy berries with all the goodness you can want in a spring dessert. Have a potluck or graduation around the corner? Try these in a big 9×13 or individual servings for a special touch. During the winter, the kids used my strawberry patch as a ramp for their sled so they could soar through the air and put their lives at risk. It was all fine with them until I looked outside and saw what they were doing–shooting off the hill, over my sleeping berries and off the other side of the raised bed. “THOSE ARE MY STRAWBERRIES YOU GUYS! !” I yelled into the freezing air. Of course they were sorry, but who can blame a kid for wanting a little winter Olympic fun. So now it’s spring and my berries survived it seems. And I’m glad. Because once they really get rolling, this strawberry angel food lush will be the best way to showcase them. Well, one of the best. I’m still a sucker for a good strawberry shortcake too. This dish is perfect for your graduation meals or summer potlucks because it feeds a lot and it tastes so good. Make your strawberry angel food lush in a 9×13 or individual little Mason jars for a personal touch. They are sure to get gone in a flash. One note: I use strawberry gel here–it’s the stuff they put in strawberry pies if you have ever seen it. I buy mine in the produce department of my grocery store by the strawberries or the fruit dip. If you can’t find it, it would be okay to leave it out, just toss your berries in a little sugar and let them soften some before you put them on your lush. And unless you have to get the sugar free version of the gel don’t. It’s gross. Made that mistake more than once. One of the best spring and summer desserts--blend fresh berries with strawberry glaze, cream cheese, whipped cream and soft angel food cake. I've never taken this anywhere that it wasn't devoured. Slice the angel food cake into 1" cubes and layer them in the bottom of an ungreased 9x13 baking dish. Set aside. In a medium bowl, add the cold whipping cream and vanilla. Beat on high with a hand mixer or in a stand mixer until the mixture starts to foam and get slightly thicker--about 3 minutes. Add the powdered sugar and beat on high until stiff peaks form--another 2 to 3 minutes. Be careful not to over beat your cream or it will separate and turn to butter. When the mixture will hold a peak that doesn't fall over, it's ready. In a small bowl, blend the cream cheese, powdered sugar, half of the whipped cream and milk together with a handheld mixer. Spread in dollops over the cake. Use a spatula and your fingers to spread it around. It will be thick. Just do the best you can. Spread the other half of the whipped cream over the cream cheese layer. Mix the berries and glaze in another bowl and spread evenly over the cool whip. You may swap in Cool Whip here if you prefer. You'll need about 3-4 cups or one 8-ounce tub. My daughter and I made this recipe for a friends’ Anniversary, and everyone loved it! Our friends’ wedding colours many years ago, were red and white, so they adored how this dessert fit into their theme reminiscent of their wedding. And who doesn’t love strawberries?! A real crowd pleaser! We did however, cut the amount of icing sugar we used in half, for both the cream cheese mixture and the topping. Mainly due to all of us not really liking super sweet desserts. We made our own strawberry slurry, just by cooking strawberries in some water on the stove, instead of buying that gel. It is a lovely recipe and we sure appreciated it. So did all the party guests! There wasn’t one morsel left, we brought home a completely empty pan. I find the English do not make their foods overly sweet. I think it is a good thing! My fiance’ brought me some chocolates from London and they aren’t nearly as sickeningly sweet as the chocolate it here. This recipe looks divine and I plan to make it Easter Sunday, but I am going to follow suit and cut the sugar just a tad. Happy Easter everyone! Sounds delicious and I’d like to try it. 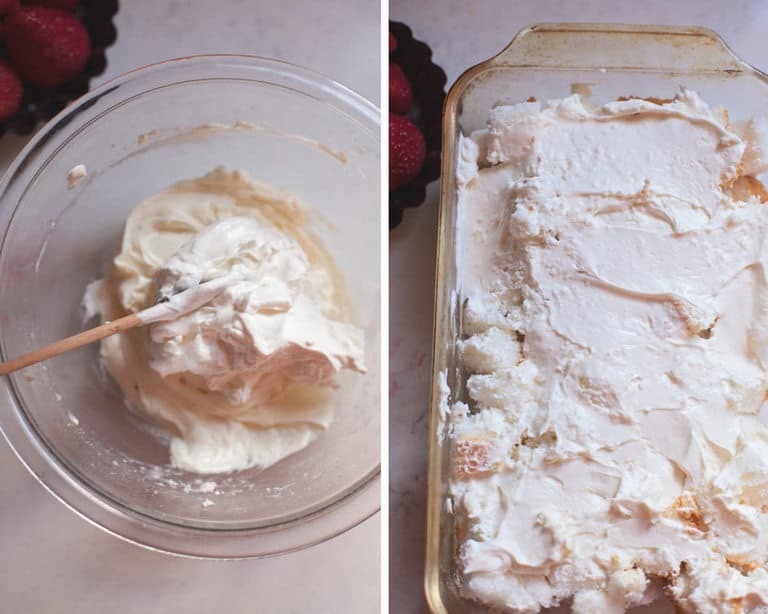 In recipe, you use only the term “whipped” cream (before you whip it, it’s “whipping” cream) . Do I need to beat the half of the whipping cream first, before I beat it in with the cream cheese? Perfect to take to a family gathering! 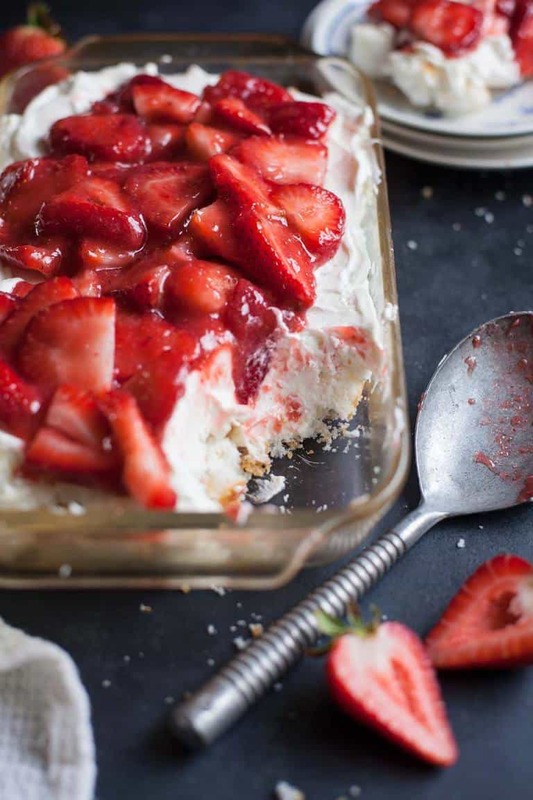 I ABSOLUTELY love angel food cake and strawberries together…..only way to make strawberry shortcake!!!! This recipe sounds amazingly good! Will definitely make this soon. Pinned. Thanks for sharing. Well hopefully you will be able to put this together soon with some fresh spring strawberries!